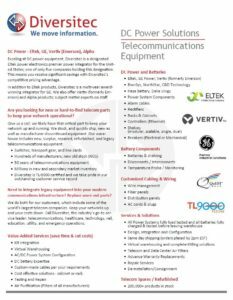 Diversitec is a 25-year-old, TL-9000 certified, privately held Richmond, Virginia based company specializing in DC Power, batteries, logistics, kitting, virtual warehousing, and new, or hard-to-find manufacturer discontinued telecom parts such as switches, transport gear, and line cards. With respect to DC Power, Diversitec is a designated Eltek power electronics premier DC power integrator for the United States; only one of five companies to receive this designation. In addition to Eltek products, Diversitec is a multi-year award-winning integrator for GE. We also offer Vertiv (formerly Emerson) and Alpha products. With subject matter experts on staff, we design, engineer, and provide turnkey DC power back-up solutions. The company also maintains millions in secondary market inventory that is new, new old stock (NOS), repaired, or refurbished; we cover nearly 50 years of telecom equipment from hundreds of manufacturers. Diversitec is under multi-year contracts with customers such as Verizon, AT&T, Frontier, Level 3, and Lightower. We integrate legacy equipment into modern communications infrastructure and replace worn out parts for some of the world’s largest telecom companies. We serve the telecommunications, healthcare, technology, rail, education, utility, and emergency operations markets. Annual surveys with our customers have produced 99% customer satisfaction; view our customer’s actual responses by category. Diversitec is the parent company for subsidiaries Edge MCS, LLC and Backhaul Engineering, LLC. (Edge MCS) is a privately held company based in Richmond, Virginia and a global OEM for the Binary Bunker and custom line of modular data centers. 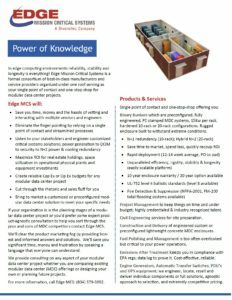 Edge MCS offers a totally engineered, PE-stamped modular data center specifically designed for edge network applications where customers require N+1 and N+2 redundancy, excellent power density and highly efficient cost of ownership. All Edge MCS modular data centers are made of rigid, lightweight concrete unmatched in durability and energy efficiency. They contain well-known & internationally available components supported by and available through, Edge MCS. Backhaul Engineering is a single-source wireless engineering services company with more than a decade of industry experience. The wireless industry counts on us to provide high-quality engineering, design, and support services. 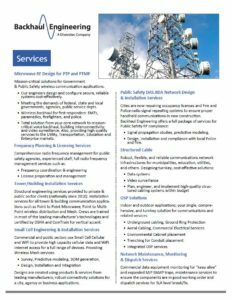 National and local clients value our experience in the areas of path engineering, spectrum management, interference mitigation and troubleshooting as well as our unmatched installation management services. Designs are correct the first time, every time; clients benefit from trouble-free operation and increased up time.